Elja – 376 AD is not only an entertaining film but also academically relevant. What is the relation between language barriers an migration? What does it feel like to not understand a language, in film as well as in real life? And why do Austrian actors do have less prblems learning a new language infront of a camera? 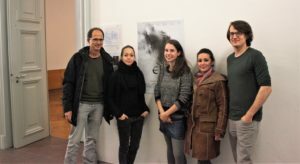 The Vulgar Latin parts of the film were translated in cooperation with the RomSem under the professional supervision of Dr. Amina Kropp. We will be back for a public screening of Elja – 376 AD at the University of Mannheim in March.